Kenmare News | Kenmare Bay Swim club is ducking and diving! Kenmare Bay Swim club is ducking and diving! 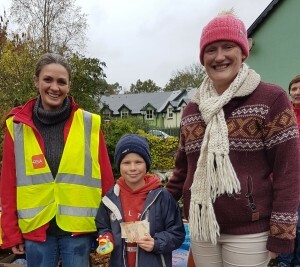 Kenmare Bay Swim Club is incredibly grateful for the generous support that we received from the many individuals and groups who helped out at our Halloween fundraising events over the October bank holiday weekend. In no particular order, thanks to Aldi, Supervalu, John Hickey Electrical, KPH, Kenmare Bay Hotel, Bia Bia, Jerry O’Sullivan Rath, Alan and Mairead O’Connor, O’Donnobhan’s, Tuosist Youth Club, KMEG, Hallissey’s Cash & Carry and the Carnegie Theatre who all helped make the Halloween Walk and Family Fun possible. Thanks also to the huge efforts yet again from the swim club members and families; we can’t thank you enough. Finally, we are very thankful to the people of Kenmare and beyond for supporting our fundraising events once again, given the change in location. Kenmare Bay Swim Club also held a very different and new fundraising event this Halloween, a Duck Race! The event proved very popular with very generous cash prizes for the winning 3 ducks and a wooden spoon prize for the last duck home. Over 300 individuals sponsored a duck for the race which gave for thrilling entertainment. There were about the same number of spectators standing on Finnihy Bridge and at the banks of the river, all cheering for the ducks to cross over the finishing line. The winning duck went to duck owned by Ruairi Daly, second to duck belonging to Matthew Miles and third to duck belonging to Aoibhean McCarthy. Last place duck went to Donie Lynch. The money raised from this event will benefit a number of charities including Pieta House and Triple Negative Breast Cancer in addition to the Kenmare Bay Swim Club. Thanks to the Corporate Duck Race sponsors Sherry Fitzgerald Daly Kenmare, Frank Ayers, O’Donnobhans, Quills, The Landsdowne, The Wander Inn, Kenmare Gift Shop, Rose Quill The Lodge Guest House, Tagline Mobile Sheep Dipping, who all sponsored the superior looking red ducks. We look forward already to next years Duck Race, which will be even bigger and better, and where we will be striving for Ireland’s largest duck race! On the swimming front, the club had great successes at the Minor and Senior Munster Schools gala on the 20 and 21 October in UL. A large presence from the club represented many schools from the area including Pobal Scoil Kenmare, St John’s NS, Cahir NS, Realt na Mara NS, Kilgarvan NS and Caherdaniel NS. Luke Merrigan won gold in 50m butterfly and 50m breaststroke at U10 and his brother Ben Merrigan won gold in 50m backstroke and silver in 50m free at U12. Cillian Meagher, Julia Salvado McCormack and Holly Arthur were all finalists in their events and have all qualified for the Irish Minor Schools Finals which takes place in February 2019. The club also recorded many PB ‘s across the Minor and Senior competitions. Well done to all. Interesting in joining our swim team? We will be accepting new members to join our entry squad in Jan 2019. If your child is ideally between 7 and 11, has completed a learn to swim programme and is keen to develop their swimming skills further, we invite you to come and try out. Book now by contacting the club on kenmareswimclub@gmail.com.